Years of running cooking classes has taught us that regardless of skill or even interest in cooking, quite a few men are into Japanese knives. It’s a weapon thing, I suppose, which is understandable given that the carbon steel Japanese knife is forged in a similar way to the katana, or Japanese sword. 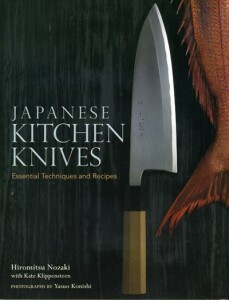 But before investing (time and money, as they are very hard to maintain) in a Japanese carbon steel knife, it’s a good idea to read the beautifully produced book Japanese Kitchen Knives: Essential Techniques and Recipes by Hiromitsu Nozaki. The book has lovely pics, being an unfortunately now defunct Kodansha International publication. It’s also full of very handy tips on how to wield the blade (p.18, 19), sharpen and take care of it, how to buy, and even some good recipes. It’s a little short on detail on the knife making process, which is a most fascinating cycle of “heating, hammering, annealing, quenching, cooling,” (p. 8) which makes the blade both durable and hard. But this is a practical book, and has many of the Japanese cutting methods like the Jabara giri (Serpent Belly Cut), Sasagaki (Shaving or Whittling used for burdock root), Chasen giri (“Tea Whisk” cut), Kazari giri (Decorative Cuts), skinning fish and sashimi cuts, all of which we have taught in our classes. The book concentrates on three kinds of Japanese carbon steel knives, the Usuba which is a squarish topped knife mostly used for vegetables, the Deba, a thick triangular shaped blade used for filleting fish, and the Yanagiba, the long thin sashimi knife most like a sword. Problem is, none of these knives are recommended as the first knife to buy in your Japanese knife collection–the most versatile is the Gyuto or the Santoku, which is most like the western knife with a narrow spine and a curved tip. As Japanese knives are softer than stainless steel, the thumb or forefinger is used to balance the grip, and it’s a good idea to learn to slice with these all purpose knives before moving onto more specialised ones. In our classes, we use the Gyuto and the 15cm “Petty Knife” (like a small santoku) most, as they are versatile, and Kei swears by the Masamoto brand, which has a shop in Tokyo’s Tsukiji market and also handles international online sales. 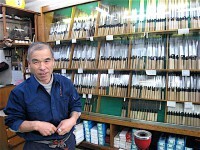 Aritsugu is also a good brand, also with a shop in Tsukiji. Only if you are prepared to maintain and most importantly, USE your knife regularly should you consider investing in a carbon steel knife. There are also fantastic stainless steel Japanese style knives, and I bought a very expensive Gyuto last time I was at Masamoto. It actually cost more than the carbon steel one, but worth it as it’s a lot easier to maintain, and so shiny, which is something that also seems to appeal to men….